EC incorporates mechanical load brake, motor brake, and overload clutch as standard. 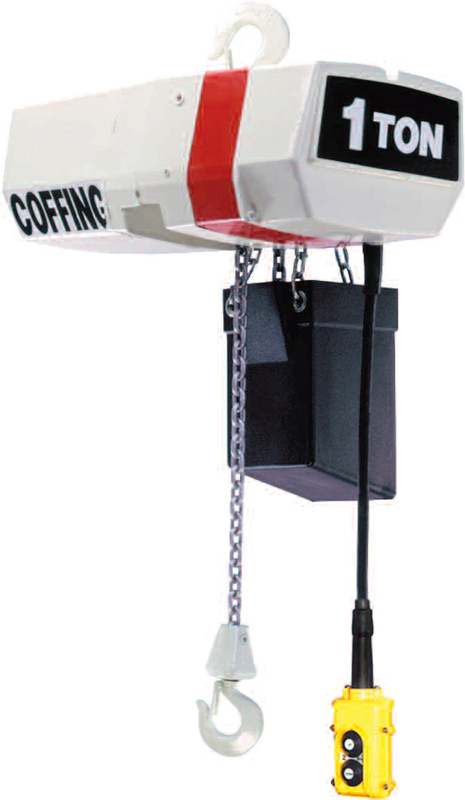 Capacities & Lift: Rated loads from 1/4 to 5 Tons, with 10, 15, and 20-foot standard lifts. Other lifts available. Standard push button drop is 4-feet less than lift. Voltage & Motor Options: 115/230, 208 – single phase; 230/460, 208, 220/380, 575 – three phase. 60 hertz standard, 50 hertz available. Two-speed motors available (3 to 1 speed ratio). Suspension Options: Rigid or swivel top hook, lug, plain, geared, and motorized trolley available. Durable Construction: Built in compliance with ASME/ ANSI B30.16 and CSA standards. Options: Full line of accessories available.